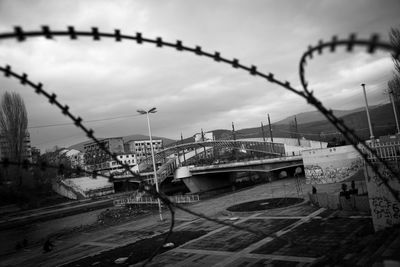 Wissam is a Journalism student in Moscow and former Syrian Army officer. After being forbidden by his advisor teacher of writing his final paper on the farce of Russian coverage of the conflicts on Syria, he decides to head back to his homeland to make a film and show Russians what's really going on in his country. But they seem to have already been persuaded by state TVs' official propaganda pro Bashar Al Assad. This teaser refers to a full HD 50 min. documentary film. March 23, 2013, Manshiyat Naser, Egypt. 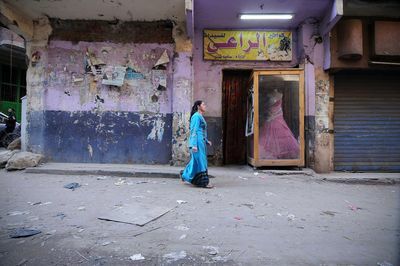 A Coptic woman is walking pass a bridal store inside the slum. 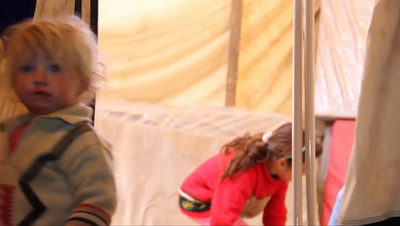 Syrian refugees in the Zaatari refugee camp, Mafraq, Northern Jordan, speak about their stories and perspectives. Full transcript and translation available on request. 00,57الجيش السوري هو من آذاني وهو المسؤول عن تحطيم جسدي والتسبب بعدة كسور فيه ، لقد كسر لي أضلاعي الاربعة اضافة لكسر في الجمجمة وانقراص في العمود الفقري ، خرجت من الاعتقال وفي كل سنتيميتر من جسدي كسر. الكسور هذه هل هي بفعل الجيش النظامي؟ نعم من الجيش هل تم اعتقالك من الطريق العام؟ لا . لقد تم اعتقالي على أحد حواجز الجيش. 1,25 سقوط البراميل المتفجرة على منزلنا جعلت طفلي بسبب الخوف بفقد النطق . 1,44 حالات الاغتصاب كثيرة فهي جرت في عدة قرى وليس فقط في قرية "صيده" ، عندنا في خلال عمليات الاقتحام كانوت يحضرون النساء والاطفال "الجيش النظامي" , احدى المرات جرى اشتباك بيننا على جسر "صيده" فوضعوا امامنا سبعة أطفال أمام الدبابة بعمر طفلي..هل وضعوهم كدروع بشرية ؟ نعم . وقبل هذه الحادثة جرى بيننا اشتباك على طريق داعل فوضعوا أمامنا فتاتين عاريتين ، فأدرنا ظهورنا وانسحبنا للخلف، لقد انسحبنا. The Mitrovica bridge over the river Ibar that divides the town into an ethnic-Serbian north and an ethnic-Kosovo Albanian south. Seen from the south through barbwire. Sudhram holds a photo of his wife Rukhmani Bai, who suffered and died from cancer in 2012 at the age 38. 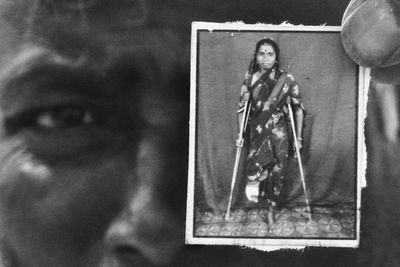 He had to sell over five acres of his land to upper-caste farmers to pay for her hospital bills. Today, he himself has the similar lesions that led to his wife's death. He laughed when I asked him if he was afraid of death.